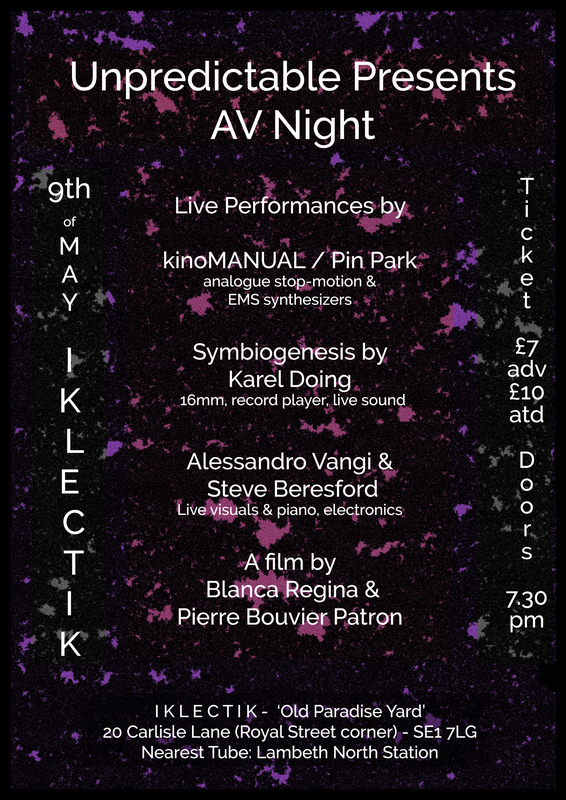 This is an evening dedicated to various audiovisual performances, combining digital and analogue approaches. There will be a trio all the way from Poland. Formed of two duos – kinoMANUAL and Pin Park LIVE – they’ll explore mainly analogue stop-motion techniques and improvised music. Their aim is to achieve optimal sound and structure, using only the unusual architecture and unrepeatable timbres of EMS synthesizers. Karel Doing will present Symbiogenesis: a series of repeated rhythmic musings on nature and culture, often using superimposition. This 16mm projection is combined with live sound, a layering of optical, found tracks, and a collection of rare records played on a prepared Dansette record-player. The evening will also feature the first collaboration between Alessandro Vangi and Steve Beresford. Vangi will use video filmed in Cairo and computer graphic as tools of the performance. The show will be the result of a combination of many elements that are connected to the human being in different shapes. Steve will explore the inside and outside of the infamous Iklectik piano with small implements and electronic gizmos. Finally, the evening will feature the premiere of a film by Blanca Regina and Pierre Bouvier Patron. The film, shot in Tenerife, Spain, focuses on the specificity of the volcanic soil of the island. Exploring textures, organic elements and rhythms, this short film dives into the magic elements of this unique land. 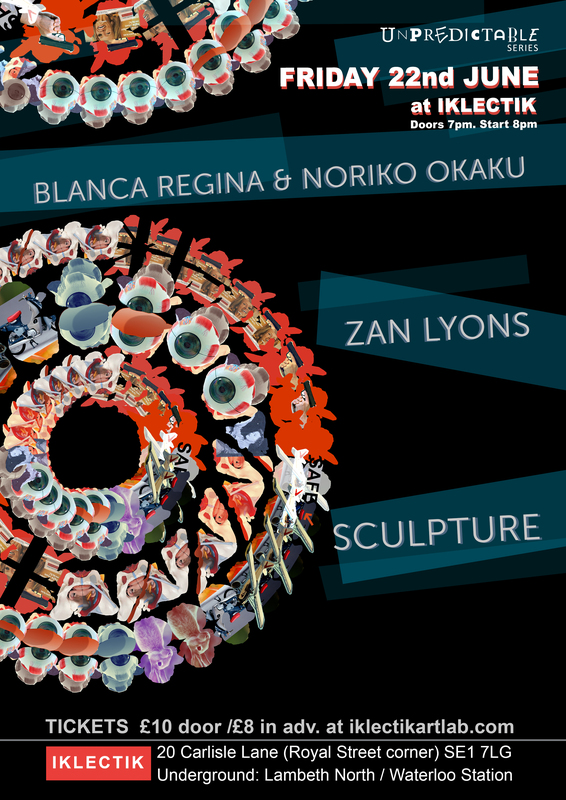 ‘Unpredictable Series’ presented, on the Friday 22 June, an evening of audiovisual concerts at IKLECTIK in London, with internationally acclaimed artists Sculpture, Zan Lyons, Blanca Regina & Noriko Okaku. ‘Triple loop’ is a new audiovisual performance by Blanca Regina where she uses Oracle systems and audience participation to envisage our inner narratives using her voice, electronics, objects and visuals. ‘Triple Loop’ invites Noriko Okaku as a second performer this time. She brings her self-made Derbyshire tarot cards that were produced as an extension of her animation work The Interpreter (2015). One of the most distinctive audio/visual performers to date, violinist, producer and film-maker zan lyons’ stunning shows have received critical acclaim across the globe. Explosive beats collide with melancholic concertos. Using his laptop and custom foot pedals, Zan loops his violin, voice and sounds – while manipulating his haunting visuals – to incredible effect. Zan’s film making process retains the organic approach established by his music. A one man army, Zan directs, shoots, edits, and lights all of his films himself as well as doing all of the complex animation and visual effects work. The result is hypnotic and otherworldly, bringing a truly cinematic vision to the audio/visual world! Zan plays in empires band ‘the hellish vortex’ and is currently performing live visuals of his own creation the newly reformed Atari Teenage riot. Discovering transitory possibilities in live A/V performance is central to the process of Dan Hayhurst and Reuben Sutherland. Utilizing an ever expanding library of zoetropic prints, Sutherland’s visual turntablism combines mechanical imaging technology with cutting-edge digital techniques in hallucinatory loops and jumps. There’s a clear connection with the chaotic physicality of Hayhurst’s sonics – unstable permutations of tape loops, no-fi electronics and digital sequences played with a battered reel to reel tape recorder, computer, walkman, sampler and FX units.The duo’s forthcoming album/graphic novel, Nearest Neighbour, will be released on their own Tapebox imprint in August 2018.Through 2015 and 2016 Sculpture released tapes on Phinery and Digital Death Records, an animated 8″ lathe cut postcard on Hasenbart Records, a 7″ animated disc, Zyprazol (Tapebox), and a 12″ zoetropic EP, Form Foam (Ana Ott). Sculpture’s Membrane Pop LP was released in 2014 by Software, a label curated by Daniel Lopatin, AKA Oneohtrix Point Never. A live AV cassette/digital/video splice, Video Plot, followed in October. In January 2014, the duo’s self-released animated 7″ single, Plastic Infinite, became an instant cult artefact.Sculpture previously made two animated zoetrope picture disc LPs for Dekorder records – Rotary Signal Emitter (2010) and Toad Blinker (2011). Their third LP, Slime Code, was released in 2012 on 7 unique cassettes plus digital edition by patten’s Kaleidoscope imprint and later reissued on vinyl by Digitalis.